Introducing the Mario Kart EU Limited coins series - 3 coins. For this specific LOT. Whats in the set?. Each coin has a little number on the front from 1 - 24, symbolizing which coin in the series it is! Frankford Wonder Ball Super Mario Bowser Coin Unopened. You may also be interested in. These are increasingly hard to find! Introducing the Mario Kart Series of Collectible Coins! There are originally 24 coins to collect in this set - all different characters from the Mario Kart 8 Series on Wii U/ Switch. The coins in the set can be equipped with colorful rubber wheels, these are like "tires" and you can roll the coins on the ground as if they are "racing" with these rubber rings - or just display them in your collection! Smash Collectible Coin (no Plastic casing/cover). Excellent: This item has been used but shows little to no evidence of wear and tear due to usage. This item is without cracks, scratches, or noticeable wear. These coins were exclusive to the park. The park ran from 2013 - 2019 February. The 2 characters are ROCK LEE and UZUMAKI NARUTO. Introducing J-World Tokyo Exclusive Naruto Character Coins! The exact year is unknown for these coins, only that they were issued between 2013-2019. New! Nintendo Super Mario Bros. Exclusive Castle Coin Bank by Culturefly - NIB! New! Nintendo Super Mario Bros. Exclusive Castle Coin Bank by Culturefly - NIB!. Condition is New. Shipped with USPS First Class Package. New and sealed. Other coins are available for combined shipping. If Ebay doesn't auto combine the shipping at check out you will receive a refund of the difference when shipped. Frankford Wonder Ball Super mario Coin Unopened. Wonder Ball Super Mario Luigi Coin Unopened - Rare Nintendo- Video Game. Condition is New. Shipped with USPS First Class Package. Loot Box Exclusive. Culturefly Super Nintendo SNES. Console Collectible D-Pad Coin Token. Introducing Super Mario World Arcade Coins! "NOKO NOKO or "Shell Koopa"". Obverse reads Banpresto 1991. Golden color mostly intact, there is noticeable discolor/fade spot on the front behind the "15000" and slightly on the rear under the Banpresto B. Introducing the Mario Kart Series of Collectible Coins! There are 24 coins to collect in this set - all different characters from the Mario Kart 8 Series on Wii U/ Switch. The coins in the set can be equipped with colorful rubber wheels, these are like "tires" and you can roll the coins on the ground as if they are "racing" with these rubber rings - or just display them in your collection! These were Exclusive to Japan, and never made it out of. Introducing Super Mario RPG Coins! The coins were released to c oincide with the release of Super Mario RPG:Legend of the Seven Stars in 1996 from the then developer "Square". Introducing the EPOCH Mario little collectible coin! The exact year is uncertain, but is predicted at early to mid 2000s. If there is ever a problem with your order. The casing has wording of all sponsors, and official pokemon park labelling - Pikachu doing his thing. Nintendo stuff! ====================================================================. Great item for Super Mario fans. Good weight to it. Still in original plastic wrap. Never opened or touched. These 2 coins are cool because the pokemon art on the front has a 3d effect, you can feel it as you move your finger over the coin, it isn't a flat surface. These coins are a faded silver and faded bronze. Introducing the Mario Kart Limited Edition Coins. The front of each coin is colorful and has wording "MARIO KART". Each week, 1 different coin was released (4 weeks - 4 coins). The obverse of each coin is an all golden color with wording depicting which Cup that coin represents. 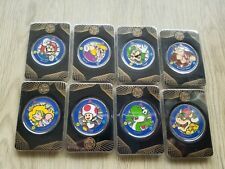 You are bidding on 1 (ONE) SUPER MARIO BROS. COLLECTIBLE COINS MYSTERY BLIND PACK NINTENDO 2018. Condition is New/Sealed. Shipped with USPS First Class Package. Introducing the Mario Kart Limited Edition Coins. The front of each coin is colorful and has wording "MARIO KART". Each week, 1 different coin was released (4 weeks - 4 coins). Each plastic casing depicts that coins' image on a shiny holographic sticker with "Limited edition" wording. **NOT A MINT COIN** Very very good shape though! Frankford Wonder Ball Super Mario princess peach Coin Unopened. You may also be interested in. "Super Mario ". Super Mario. Light coin color fading on front to the right of Mario, and around eyebrows. There were 5Character & Enemy coins in the series. Surface scuffs present on both sides, decent condition given its age. Nice for collecting or as display pieces to accent your collection. There are six different color rings and one is placed at random. You are viewing a Japan Railway 1998 Promotion for Pokemon ! This event was held in 1998. Nintendo stuff! Minor scuffs on both sides, no ribbon or keyring included. Frankford Wonder Ball Super Mario Bowser Jr Coin Unopened. Obverse reads Banpresto 1991. Introducing Super Mario World Arcade Coins! "PRINCESS PEACH ". A Series of 10 different coins from the Super Mario World series! All coins in their best condition are golden front and back. A very cool collectible piece. The clear plastic case has a nice golden color engraving / etching of 2 Gundam Characters, upon removing the cover, we see 10 coins fit snug in their very own spaces. 8 coins are 1 size, the 2 center coins are a larger size.There is no sticky adhesive behind the coins, they are free fall! New Sealed Blind bags with Super Mario Bros Collectible coins in them. Who knows, as these are blind bags and that's half the fun! Lot Of 11 Frankford Wonder Ball Nintendo Super Mario Coins. Condition is New. Shipped with USPS Priority Mail. SUPER MARIO BROS. Coin Collector’s Album Book THINKGEEK NINTENDO 2018 New Sealed. Condition: New and sealed. New, but opened to identify the coin. 1st coin: Listed price. Introducing Super Mario World Arcade Coins! "BOWSER or "Koopa" ". Bowser pose 1. Bowser pose 2. Obverse reads Banpresto 1991. A Series of 10 different coins from the Super Mario World series! All coins in their best condition are golden front and back.